The conference is organized by the More and Better Network, African Centre for Biodiversity, Alliance for Food Sovereignty in Africa, Asian Farmers Association, Climate Smart Agriculture Youth Network, EAT, FoodFirst, Foodtank, IFOAM, Institute for Agriculture & Trade Policy, MIJARC, Millennium Institute, Oakland Institute, PROPAC, Right to Food Campaign (India), Sustainable Fish Farming Initiative (SFFI), #Women2030, Heidehof Stiftung, Karibu Foundation and Agroecology Fund. More organizations will join. Important key issues to debate on during the conference are summarized in the sign-on letter which 130 civil society organizations have signed on to. 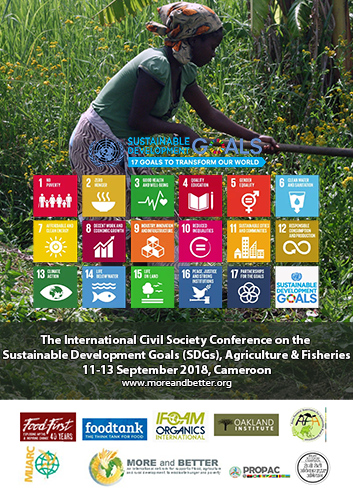 The More and Better biannual General assembly will take place during the SDG-conference. The transition to agroecology and food sovereignty in Tanzania and Mozambique. Conversations with Mviwata on peasant markets, and with UNAC on the contributions of peasant farming for society as a whole. Through the open access farmers’ knowledge portal www.accessagriculture.org Access Agriculture share quality farmer training videos in English, French, Spanish, Arabic and more than 75 local languages. On April 5, the Food and Agriculture Organization (FAO), the World Future Council (WFC) and IFOAM – Organics International kicked off a global contest for the world’s best agroecology laws and policies. There will be many interesting and important conferences about food and agriculture in many parts of the world in 2018. You will find some information and links to more about several of them here. This book argues that sustainable development, based on sustained growth, has led us to an impasse. In response, Agroecology brings back notions of eco-development and co-evolution with nature as a refreshing paradigm.The author, Angela Hilmi, is senior research fellow at the Centre for Agroecology, Water and Resilience of the Coventry University. The book critically examines the kinds of knowledge and ways of knowing needed for food sovereignty, agroecology and biocultural diversity. It is edited by Professor Michel. P. Pimbert, Executive Director of the Centre for Agroecology, Water and Resilience at the Coventry University and recently nominated as member of the High Level Panel of Experts of the Committee on World Food Security of the UN Food and Agriculture Organisation (FAO). The International planning committee for Food Sovereignty (IPC) is currently leading the debate within the Food and Agricultural Organization of the UN (FAO) about what public policies can be proposed to promote and support a common vision of agroecology as developed by social movements and their allies (see the Declaration of the International Forum of Nyeleni). This year’s edition of the State of Food Security and Nutrition (SOFI) marks the beginning of a regular monitoring of progress towards achieving the food security and nutrition targets set by the 2030 Agenda. The report warns that the world hunger is on the rise after gradually declining for over a decade, affecting 11 percent of the global population with an increase in the number of undernourished people from 777 million in 2015 to 815 million in 2016. Launched the 26th September 2017 at the Food and Agriculture Organization of the United Nations (UN FAO), the Right to Food and Nutrition Watch marks its tenth anniversary by taking stock of the last decade, when the world food crisis brought the number of hungry to a peak. Today, despite some progress, many of the problems that led to the crisis in the first place persist and continue to affect millions.